If you haven’t launched the App Store app today, you may want to take a look. Steve promised a better world of not always needing to have our iPads connected to our desktops and more information around apps purchased on the same account by different users. Before this update, a family could have multiple devices on the same account, all buying different apps, with other family members unaware of the app already having been purchased. If a person attempted to buy the app that was previously purchased on the account, they wouldn’t be charged. But, there was no way of letting all family members know of an app available for their use. This is the same for companies all sharing the same account. Now, within the iPad’s App Store, you have a full view of what is owned on the account and the ability to download it without doing a sync to the desktop. This is much easier to use than the desktop iTunes App area for finding apps you own and want to install! Via the new ‘Purchased’ at the bottom of the App Store app, you can see everything you have installed on your iPad and everything you ‘had’ installed but removed. The cloud icon on this screen and all of the following is a download button to pull the app from Apple’s Cloud to your device. Note the two tabs at the top: “All” and “Not On This iPad”, as well the two tabs on the left: “iPad” and “iPhone”. 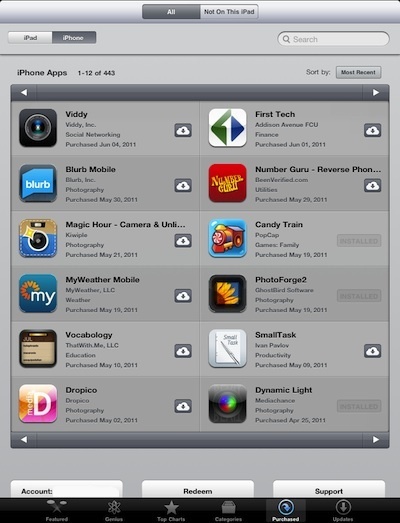 Choosing the ‘iPhone’ tab presents you with all the apps you purchased for your iPhone. they will install on your iPad, again through the ‘cloud’ icon. 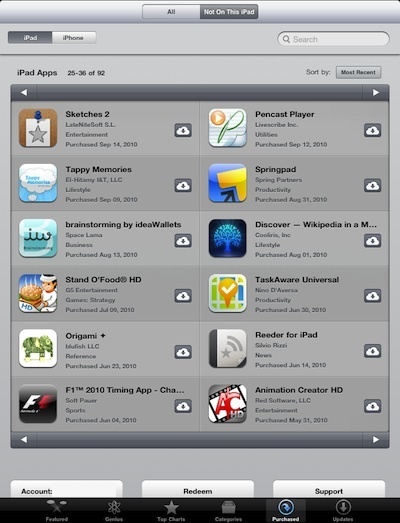 Note that these are the iPhone versions of the apps, which you may own the HD version in the ‘iPad’ tab. 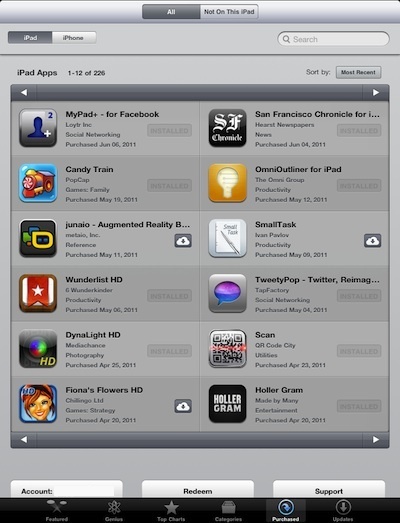 Back on the ‘iPad’ tab, now choosing the “Not On This iPad” is a full list of apps you don’t have installed. These can be ones you or anyone on your account purchased. Never noticed all those games on our accounts… wonder who in the office bought those… might have to tap the ‘cloud’ to try them out.